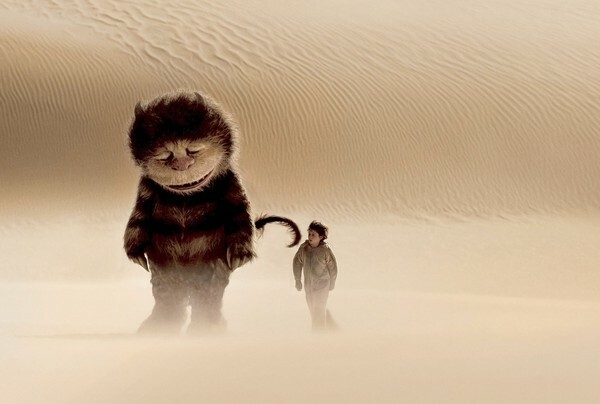 Based on the beloved children's book by the same name, Where the Wild Things Are is one of the most stylistically and tonally original films I have seen recently. It stretches out the extremely short picture book into a full-length movie about a kid dealing with his inner Id. The film follows a young boy named Max who gets in a fight with his mom then runs away to a fantasy land (which exists in his imagination) which is inhabited by monsters. In this land he finds that the creatures do not get along so he proclaims himself the King of said land and tries to get them to work together and have fun. Sounds cute and innocent, and it is. The way in which all the characters talk, act and organize games, perfectly reflects how an 8-year old boy would think. This movie gets right inside the mindset of a child. In fact, the main idea behind the film (which helps stretch it out to a full story) is that each of the ‘Wild Things’ represents a different personality within Max. So as he acts as their King, he is actually trying to understand the different parts of his inner Id, and we find out why he reacts the way he does. As the director says, the film is not a kid’s movie, but rather a movie about childhood for adults. This fantastical look at how the imagination and emotions of a kid work, is quite unique in its presentation. The film definitely looks amazing with the scenery and the notable creatures (which are a blend between computer graphics and Jim Henson puppetry). The concepts and approach to analyzing childhood imagination is mature and well articulated. The only problem that bugs me is that it is so far deep into a child’s mind that it becomes to distant to care for what’s going on. I’m not saying it doesn’t have heart, but it just feels cold and too odd for me to want to spend too much time in this land. It’s a hard sell to get someone to want to visit an 8-year old’s imaginary friends. But it is definitely still a unique vision and I can’t think of any other movie that comes close to being like this one. It is thematically like Bridge to Terabithia and tonally like Jim Henson’s Labyrinth. Summary: As met with confusion upon it’s release, Where the Wild Things Are is not a kids movie, but rather a nostalgic magnifying glass into a kid’s mind. It is absolutely creative and visually stunning, but may be too odd for some. I have it at #400 out of the 1475 movies I’ve seen on flickchart.com.